It is back yard barbecue season! Hosting an outdoor gathering is always so much fun. Why not beef up your bbq with these All American Hot Dogs? Take it up a notch, add some fun! So, let’s talk about hot dogs for a moment shall we? Do you love’em or hate’em? I remember being a kid and thinking they were the best things ever! Well, my tastes have changed, slightly, to say the least. Since I’m a much healthier eater now than when I was a kid, I have a hard time buying hot dogs. Simply because they are processed and often loaded with things that aren’t the best for you. I’m continuously trying to make the best possible version of whatever I’m making. So, while I don’t think there is such a thing as a “healthy” hot dog, there are better for you options. I love to keep entertaining simple but delightful. So these All American Hot Dogs really do bring the norm to another level with added barbecue pork and creamy cole slaw. But, it doesn’t take too much more effort. 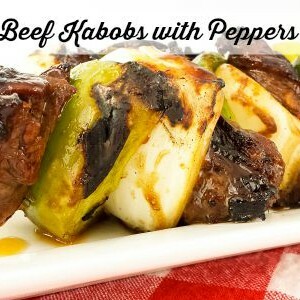 And, I’m using all beef, no nitrates, blah blah blah… they’re better for you! 🙂 I’ll also use an all natural barbecue sauce, and broccoli slaw instead of cabbage. Season the pork shoulder generously with season all or some other all purpose seasoning. Cook the pork shoulder, low and slow until you can shred it with a fork. 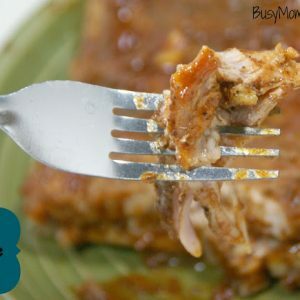 Shred the pork with a fork and place into another pan or container. Add barbecue sauce and stir well. Make the slaw~ combine mayonnaise, mustard, vinegar, honey, and salt and stir well. Add a 12 oz package of broccoli slaw and toss to combine. Top with poppy seeds. Put it all together! After grilling your dogs, top them with bbq pork and slaw and enjoy! I used the slow cooker to cook the pork shoulder. It needed a good 10 hours on low. For sure prep this beforehand. If you’d prefer to use your oven, see this shredded pork recipe. You can use regular cole slaw if you prefer, or chop up your own green cabbage, red cabbage, and carrots. I chose broccoli slaw to add some more nutrition. I hope you enjoy these as much as we did. It was a nice way to change up the regular routine without too much more effort. 1 package of all nautral all beef hot dogs no nitrates added. Prepare the pork, by seasoning generously with seasoned salt. Cook in the slow cooker for 8-10 hours on low, or until you can easily shred with a fork. Shred all the pork, place it in a pan on low heat to maintain warmth. Add barbecue sauce (about 2 1/2 cups, or to taste) and stir to combine. Combine mayonnaise, mustard, vinegar, honey and salt together and stir well. Add the broccoli slaw to the dressing and toss to coat. Grill hot dogs until hot throughout and plump. 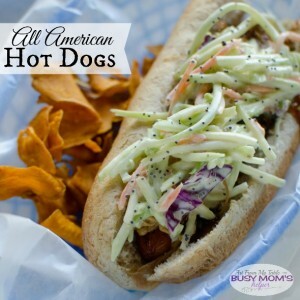 Top each hotdog with bbq pork and creamy cole slaw, garnish with more poppy seeds if desired. Looking for more back yard bbq ideas? We had a snow day today. Again. This is the 5th or 6th one this school year – and we live in Texas. WOW! One thing that can help me feel nice and warm (or at least pretend) is grilling. 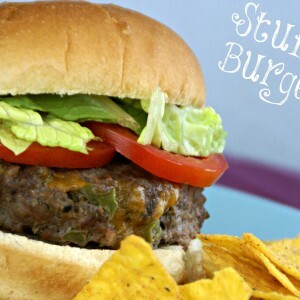 There’s a lot of things I enjoy grilling, but today I’ll share a huge favorite: Stuffed Burgers! Read on and drool…. *Green peppers, tomatoes, carrots, lettuce, pickles, etc. In a large bowl, mix the veggies and shredded cheese into the ground beef. Take a chunk and form it into a patty. 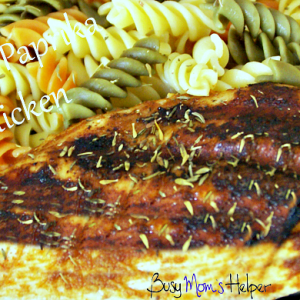 Cook all the way through – on a grill or in a frying pan. Place patty on bun, prepare as you like (mayo, ketchup, etc.). ENJOY!!! • Olive Oil ¼ cup & 2 tbsp. • Rosemary 2 ½ tbsp. • Balsamic Vinegar 2 tbsp. • Red Pepper Flakes ½ tsp. 1. In shallow pan, mix soy sauce, ¼ cup oil, honey, shallot, 1 ½ tsp. rosemary, ½ tsp. salt, and black pepper. Place steak in the pan, coating with marinade. Rotate every few minutes to get both sides. Move on to step 2 while it marinates. If you will be using a charcoal or gas grill, get it warming now. 2. Cut the peppers and onion. My family cuts them into bite sized pieces, but some prefer it in strips (as in picture above); it is your choice. In a large frying pan, use the remaining olive oil over medium-high heat. Put in the vegetables. Season with salt and pepper to taste. Saute until tender; this takes us about 9 minutes, but we prefer ours really tender for our little ones. Add the remaining rosemary and pepper flakes. Cook for another minute, then add the vinegar and stir until it’s absorbed; remove from the heat. 3. Put the marinated steak onto the grill and cook to your preference. When cooked, put on clean working surface and let sit for a few minutes. When it’s cooled a bit, cut the steak as desired. Some do it in thin strips, but we cut ours smaller for our children. 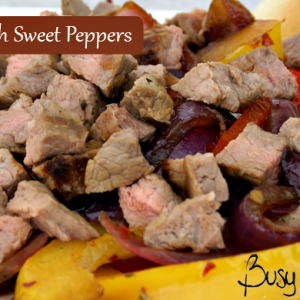 Mix with the peppers and serve. Notes: This is a great meal to get a variety of colored vegetables. My children and I are not huge fans of onions, so I do cut those in large slices so they can be picked off those plates. There are no green peppers shown in the photo above because they were eaten ahead of time by unknowing family members. I don’t have a grill myself, but really want one, and use a small counter top one until I’m able to afford a large outdoor grill. There’s just something about that smoky flavor that I really enjoy, and has the comfortable feeling of home to it. We got my dad’s hand-me-down charcoal one several years ago, but when we moved from Utah we just couldn’t bring it with us. For those that DO have a grill, here’s another great grilling recipe, perfect with that smoky touch to it! In bowl, mix the paprika and cumin. Add the lime juice and olive oil. Place the chicken on a baking sheet, and brush with olive oil mixture. Sprinkle with salt and pepper. Cook the chicken on the grill, until cooked through. Sprinkle with lime zest and thyme. Serve! 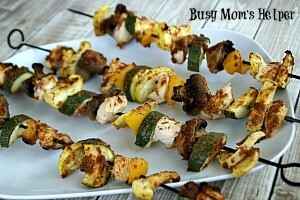 Notes: This goes wonderfully with grilled corn, if you have some!